The Soviet T-34 medium tank was one of the most famous and effective fighting vehicles of the Second World War. Along with the German Tiger and the American Sherman, it was a landmark in tank design that changed the course of the conflict. 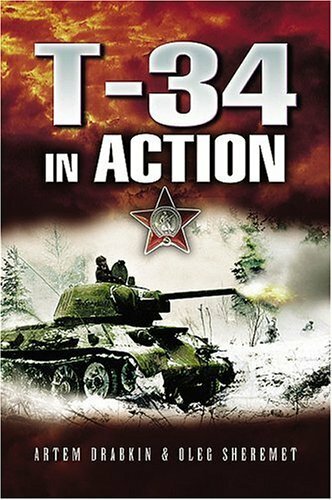 Much has been written about the technical history of the tank and the vital part it played in the huge tank battles on the Eastern Front, but less has been said about the men who went to war in the T-34 - who lived, fought and sometimes died in these remarkable machines. This pioneering book, which is based on extensive interviews with tank crews, records their experiences and offers a compelling inside view of armoured warfare in the mid-twentieth century. Artem Drabkin is the creator of the website I Remember which is devoted to recording the oral history of the soldiers and airmen who fought on the Eastern Front. His archive of memoirs and eyewitness accounts is a valuable source for researchers who are studying the Soviet side of the fighting, and it is a fascinating record of the experience of war on the Eastern Front. His previous publications include Tank Rider and Red Road From Stalingrad.